Roeder Consulting's A Sixth Sense for Project Management® Assessment is a leadership style questionnaire that compares your strengths to those found in the most successful directors of project and change management. 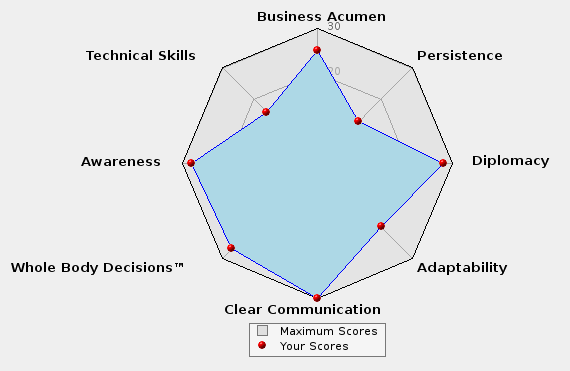 Serving as a form of business personality test, the assessment will help you quantify and track your sixth sense, business acumen, and technical expertise over time with the "spider-chart" feedback tool. Designed for everyone from novices to seasoned professionals, our jargon-free tool analyzes your level of interpersonal mastery and your project management skills. A virtual treasure chest of content, including step-by-step guidance and exercises, is provided with your results. This will allow you to identify and correct your weaknesses while reinforcing your strengths in the change management process. After taking the project management assessment and determining your organizational change style, schedule a 30-minute Expert Feedback session to discuss how your results will translate into the real world. We help you clarify personal strengths and walk through any areas to consider for growth in the field of organizational change management. The tool is painstakingly designed to serve as the launching pad for a thoughtful conversation. Your personal leadership development will be greater if you understand the nuances of each of the eight areas analyzed, as these qualities of an effective leader will help you to direct your organization towards positive change. As we review the assessment results with you, we will help you apply the lessons to your daily activities via progressive thinking and habit-forming.